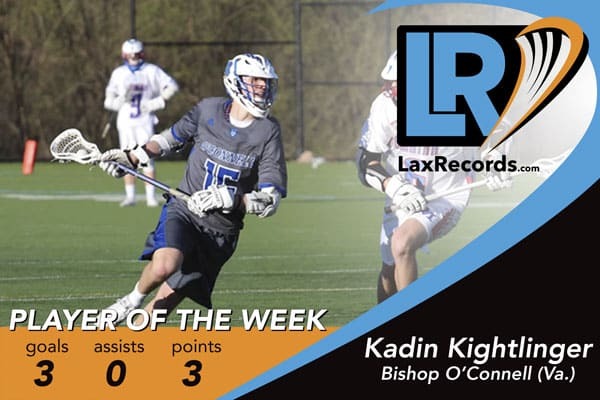 During 2017, LaxRecords.com will name a Player of the Week each Tuesday. Submit players statistics to LaxRecords.com for consideration in future Player’s of the Week. 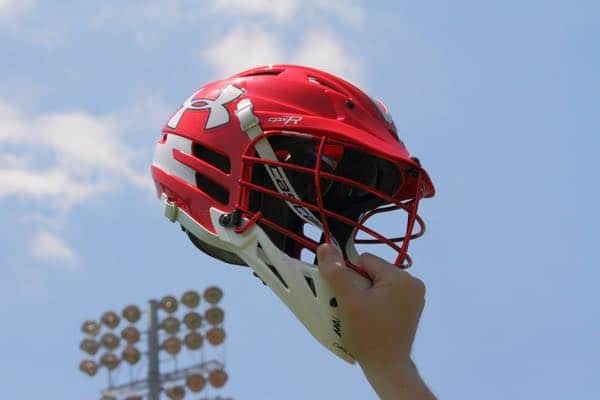 You can follow the link above or use LaxRecords.com/player to make submissions. Player of the Week winners do not need to fall into the minimum categories that determine the Best Known Stat Leaders, so submit any performance you feel warrants consideration. Kightlinger helped the Knights to a historic win on Thursday. The senior midfielder scored three goals, including the game winner in overtime as Bishop O’Connell defeated DeMatha (Md.) 8-7 on March 8. Kightlinger scored 40 goals as a junior last year, following up a 30 goal sophomore year and 34 goals as a freshman. He committed to play at Gettysburg over the summer and plays club lacrosse with the Virginia Lacrosse Club. The win marked the first time Bishop O’Connell defeated DeMatha in the program’s 27-year history. Last year, the Knights lost to the Stags 16-3. The win also marked the first Washington Catholic Athletic Conference win for new head coach Kevin Giblin, who took over the program this season. The Knights improved to 2-0 on the year with the victory. Adams helped lead St. Andrew’s to a 3-0 record last week with wins over Plano West (Texas), West Boca (Fla.) and Saint John Paul II (Fla.). In the three games, Adams totaled 18 points on 14 assists and four goals. (1-2 vs West Plano, 1-5 vs West Boca, 2-5 vs SJPII). For the season he has 29 assists and 15 goals in 12 games. Lamb totaled five points for Oak Hall, helping lead his team to a 9-7 win over Maclay (Fla.) on Wednesday. The win was a landmark win for the Eagles who had lost 11 consecutive games to the Marauders, dating back to 2005. O’Hanlon led the Cubs with four goals and one assist to help Loyola defeat Foothill-Santa Ana 13-7. It was the first-ever win over the Knights for the Cubs. Sorrells scored six goals and dished out three assists as Allatoona defeated North Gwinnett 12-11 in overtime. The senior is coming off a 60 goal, 29 assist junior year. The senior was a big reason for Torrey Pines’ 14-11 win over St. Ignatius Prep (San Francisco, Calif.) on Saturday. The attack man had five assists and three goals to lead the Falcons to the victory over a team many polls had ranked among the Top 25 in the nation. Voelkel scored a team-best six points on three goal and three assists in an 8-7 win over Jordan (Durham, N.C.) on Tuesday. Vanderlinde scored four goals, but it was the final two that led Creekside to an 11-10 overtime win over St. Augustine (Fla.) on Thursday. Vanderlinde scored the game-tyring goal with 4.3 seconds left, then scored the game-winner with 2:47 remaining in overtime.